CPR provides on-site repair, depot service and spare parts for printers and plotters. CPR specializes in the field service of HP and Okidata laser, color laser and dot matrix printers. Our factory trained warranty authorized technicians repair over 90% of all printer service requests on the first visit to your office. Our average response time from dispatch to repair is less than one business day . CPR cellular dispatches fully stocked repair vans, which greatly reduce your printer downtime and repair expense. We unconditionally guarantee all services, parts and products. At 92, The Puget Sounds last typewriter repairman loves his Selectrics In his crammed Bremerton typewriter repair shop, at age 92, Bob Montgomery continues his love for the machines that started at age 7 or 8. 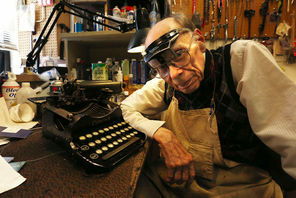 In Bellevue, you can find Dave Armstrong, who also repairs typewriters. CPR Partners with NuLeaf Office Solutions, $50 Off First Order Call Computer Printer Repair CPR today at 1-800-955-4075 to find out how you qualify for $50 off your first supply order with NuLeaf Office Solutions.